Update: The members of Stone Temple Pilots have now released a statement regarding Scott's death. Read it over here. According to TMZ.com, former Stone Temple Pilots and Velvet Revolver singer Scott Weiland was found dead on his tour bus in Minnesota. 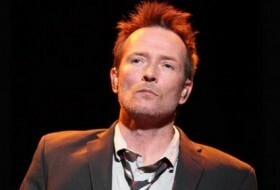 A source connected to Scott's band The Wildabouts says Weiland was found on the band's tour bus Thursday night around 9 pm, shortly before the The Wildabouts' live set at the Medina Ballroom. He was 48. Stone Temple Pilots fired Weiland in 2013 after reuniting with him in 2010 for a series of tours and one self-titled album. The band had previously been on hiatus since 2002, primarily due to the singer's struggles with drugs and alcohol. The band then recruited new vocalist Chester Bennington. 6 Comments on "Ex-Stone Temple Pilots Singer Scott Weiland Dead"
I have loved Scott since the early 90's. He has been my all time favorite. I always feared his early death from drugs. Don't know what happened yet, but it's a huge loss either way. He was hugely talented. I'm glad he was around as long as he was though. Rest in peace my friend. You will be missed. I will miss seeing you in concert. You danced like a God. A part of me has died with you. "There's no junkie out there with a happy ending"